Voted the hippest neighborhood in the US, San Francisco's first neighborhood, The Mission District is still the heart and soul of vibrant San Francisco. You've shopped at Union Square. You've eaten crab Louis on Fisherman's Wharf and had pot stickers in Chinatown. You've strolled through North Beach and ridden halfway to the stars on a little cable car. These are all perfectly pleasant ways to spend time in San Francisco, but they're not the end of the story. They're not even the beginning. San Francisco's very first neighborhood—the sprawling, gritty, and sunny Mission District—until recently was all but unknown to visitors. It was here, in 1776, that Spanish padres founded a mission, and it is here, today, that you will find the city's most exciting and surprising cultural mix. The best restaurants are here and an arts scene is flourishing, Many cool clubs, trendy shops, used bookstores, hipsters, activists, and techies all call the Mission home. We will begin at a Golden Fire Hydrant and make our way through Dolores Park; originally a Jewish cemetery. Now it may be packed with hipsters, gay men, Latin American immigrants, dogs, their owners, and well-to do families with strollers and children. Hear the story of how the great fire of 1906 was stopped right there on 20th Street, where one side of the street is considerably older than the other. We will travel up and across Liberty Hill to view the stately Victorians, stroll vibrant Valencia Street, where we will see a miniature park dedicated to the Triceratops. Then were off to see The Women's Building, B'nai David Temple, hidden gardens and an alleyway or two of stunning murals. After paying our respects at the birthplace of the burrito, and buzzing through the exciting area of 16th and Valencia, we'll visit "Creativity Explored " on the way to "El Camino Real", past the bull ring where Longhorns were pitted against Grizzly Bears, a gay synagogue that houses a Menonite community, a German speaking Lutheran church and we will end our exploration at the Missión San Francisco de Asís- commonly known as Mission Dolores. The Mission itself, was originally built close to the banks of a creek that on the day the Spanish first found the creek, there were several natives crying near it's banks. So the Spanish called the creek "Arroyo de Nuestra Señora de los Dolores," meaning "Our Lady of Sorrows Creek. But mosquitoes, winds and grizzly bears eventually had the padres think twice and they relocated a few blocks uphill. The creek, now referred to as Mission Creek, in later years was used as somewhat of a sewer system and then was buried under the city streets. 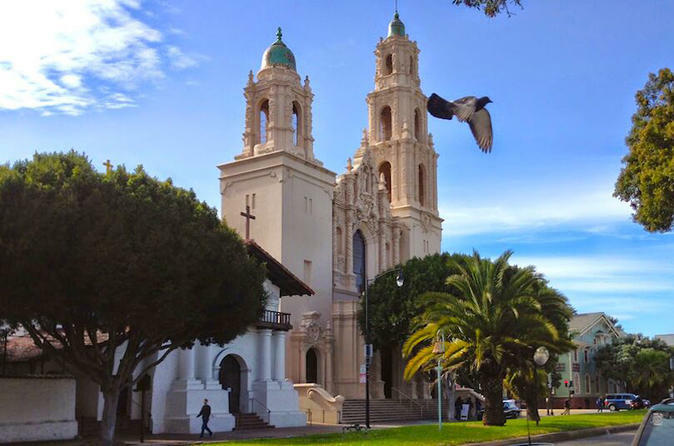 We will see the Mission Dolores Basilica which was dedicated by Pope Pious in 1951. In 1987, while protestors chanted, Pope John Paul ll caused a scandal by hugging a child with AIDS. Though this is where we say goodbye, you will now have the opportunity to tour the Mission, the oldest building in San Francisco. The original building was completed in 1776, several weeks before the Declaration Of Independence was signed. There is a small museum on site displaying artifacts from the decimated native population. Tour the garden of native California plants, it's small but impressive. The graveyard, filled with tombstones of mainly Irish immigrants, is also open to the public and filled with some famous early citizens. Some 5000 Ohlone were buried here as well. Admission to the Mission is not included on this tour.